“Lucky” was voted in as the Audience Choice favorite at the 5th annual Chicago Critics Film Festival in May of this year, and has a nationwide release on October 6th, 2017. It features Harry Dean as Lucky, a 90-year-old self described atheist who is seeking spiritual enlightenment through the fellow travelers in his small and dusty Arizona town. He’s outlived his contemporaries, and seeks to outdo and out smoke against the dying light during the latter part of his life. The film – written by longtime Harry Dean associates Logan Sparks and Drago Sumonja – is a perfect last film for the character actor, and he is supported by a diverse cast which includes David Lynch (as Howard, the owner of a tortoise named President Roosevelt), Ron Livingston, Ed Begley Jr., Tom Skerritt, Beth Grant, James Darren and Hugo Armstrong. HollywoodChicago.com talked to John Carroll Lynch during the Critic’s film fest last May, and the elegant and erudite actor had a wholly creative perspective on his directorial debut, as well as a philosophy on his approach to what is now the final film of the iconic Harry Dean Stanton. HollywoodChicago.com: The script of ‘Lucky’ is multi-faceted as far as Harry’s character. Did you approach as a straight narrative or did you intend to give it the multi layers that it ended up being? 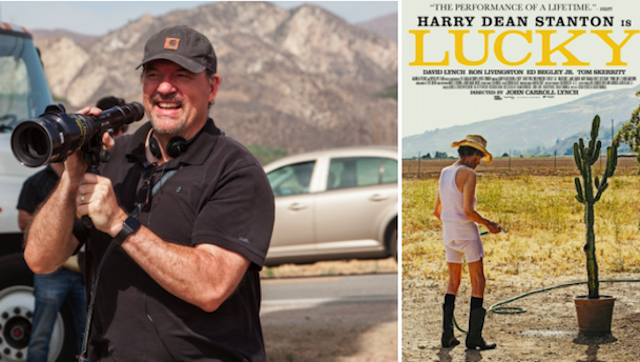 John Carroll Lynch: Well, it does have a three act narrative, but much of it is what is happening inside Harry’s character of Lucky. That’s the journey I was focused on, and that journey had realistic and surrealistic elements… that’s the way my mind works. So when the moments occurred that weren’t quite real, I married the real world with them, to make it seem like it might be a dream, or not. You couldn’t do the story of the film just by staying outside of Lucky, but I also needed to have those periods in the beginning and the end where there was a separation. But in the middle, it was about being inside his head. The way we approached the material was with that feeling in mind. HollywoodChicago.com: Since you had this idea for Lucky in your directing approach, were there any points where you had to guide Harry Dean Stanton towards that idea, given his interpretation of the character? Lynch: This was a unique circumstance. The movie itself is inspired by him. So many of the stories from Lucky’s life are actual stories from Harry’s life. Harry himself had a relationship with those stories, and the people within them, because they were, in part, his life. Logan Sparks, the co-writer of the film, has worked with Harry for 15 years, and the other writer Drago [Sumonja] has known him a long time. He was surrounded by friends in the film, so we set it up as a party that Harry Dean wanted to come to, and to motivate him to want to come to work. In a sense, I was in charge of keeping the character of Lucky alive. Those stories, though they were Harry’s, had to be placed in the right spot and had to have the right tone. The pieces had to follow one another because the journey that Lucky has in the film was clear and could be followed. Lynch: That was part of the conversation I had with him on the set. Harry and I developed a shorthand, as to where in the character of Lucky he was. But Harry is a guy who resists and that is part of reason he’s so great as an actor. He resists all artifice, all falseness and all context. That was the gist of our conversations. HollywoodChicago.com: Were there advantages to being a first-time director, and having a script done by first time screenwriters? Lynch: One the advantages of being a ‘first timer’ is the obtuse belief that you will actually make the film. [laughs] That’s a quote from screenwriter Tom Cudworth. That’s part of the reason we got it done, we just did it. HollywoodChicago.com: You spoke of making sure that Harry was comfortable with his fellow performers. Was the casting process geared completely towards that or were you looking beyond that rule in some cases? Lynch: It was a combination… I also wanted to create a world. It was important to me that this Arizona town reflected the world I actually lived in. I wanted the performers to look like the people I pass on the streets every day. For example the city of Toronto is one of the most unconsciously multi-cultural towns that I know of, and I wanted the town that we created to be like that. HollywoodChicago.com: What about James Darren, who we don’t see as often in films? Lynch: We worked with a casting director, and they did a great job. We didn’t, however, have the luxury of a long casting process, and so many of the roles are what I would called ‘rolodex casting.’ I’d worked with Beth Grant and Ron Livingston before, and landing on Tom Skerritt required a bit of a search, because we needed the right person for that scene. Hugo Armstrong was an old friend of Drago Sumonja, and came in and read with everyone. He is just a great performer, and I wanted him in the film. HollywoodChicago.com: You had an old tortoise named President Roosevelt in the film, which bookends at the beginning and the end. Do you see that particular creature as a symbol for the atmosphere of the town or of a character? Lynch: The tortoise is a symbol to me of Lucky, because he is very much like that animal in the film. He goes at his own, and they walk at similar speeds. They also symbolize longevity, and they will outlive us all. It was important to have the symbolism of eternity be represented by actual physical things, not by a sense of an eternity in a world outside our own. We live in a world where things will live past us, and we have to accept that. 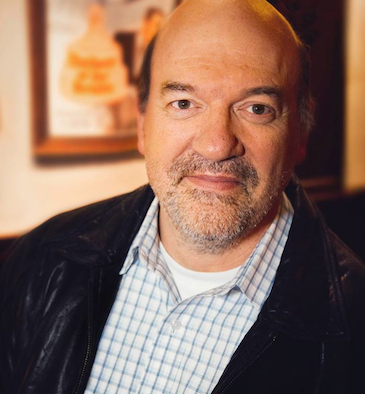 In the audio portion of the interview, John Carroll Lynch talks about the World War II generation of Harry Dean Stanton, the roles of Lyndon Johnson [“Jackie”], Maurice McDonald [“The Founder”] and other metaphysical indications. “Lucky” has a limited release nationwide, in Chicago on October 6th, 2017, at the Music Box Theatre, 3733 North Southport. See local listings for theaters and show times. Featuring Harry Dean Stanton, David Lynch, Ron Livingston, Ed Begley Jr., Tom Skerritt, Beth Grant, James Darren and Hugo Armstrong. Written by Logan Sparks and Drago Sumonja. Directed by John Carroll Lynch.